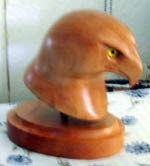 Wood carving is a form of working the wood by means of a cutting tool. The tool can be either manual or a power tool. I really prefer manual tools but the choice is up to you. Some people prefer to use the power tools. Watching the design appear before your very eyes is so exciting. You start with a piece of wood and end up with a duck or some other animal. There is nothing more satisfying then to set and look at what you created with your own two hands. Your first few projects may not be the best in the world but you a gaining confidence and skills. I wonÃ¢â‚¬â„¢t mention what my first carving looked like. I didnÃ¢â‚¬â„¢t even keep it, but I did get better all the time. Carvings can take on many forms, whether it be an animal for decoration or a chair. The primary function of wood carvings are to add extra flair to a room or recreational area, and also for more practical purposes like tables, chair, dressers, etc. A carving knife. This is a specialized knife that is used to cut, pare and smooth wood. A gouge. A tool with a curved cutting edge used for carving rounds, sweeping curves and hollows. A chisel. You can get large and small for cutting lines and cleaning up flat surfaces. A V-tool. A tool for parting and emphasizing lines. A veiner. A specialized deep gouge with a U shaped cutting edge. You will also need a vise to hold your project along with a mallet. There are also more specialized tools that you will probably want to get as you go along. A router is also very useful in some areas. I have found the best place to get my carving tools is here. Check them out. They are very reasonable and have anything that you might want. The two most common woods used for carving are Basswood and Tupelo. They are both hardwoods and are relatively easy to work with. Oak and Chestnut are lovely woods for carving on because of their durability and toughness without being too hard. Teak, Mahogany and American Walnut are also very good woods to work with and they do produce beautiful pieces of woodcarvings. For very delicate work you can use Apple, Maple, Pear or Plum.When you want your decoration to be painted and is not and intricate design you can use Pine. Remember that the actual carving should be done with the grain, not against the grain! If you have any questions or any wood carving ideas please contact me and I will add it to my site.